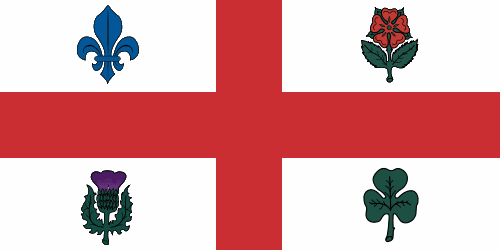 About one year and a half ago, I posted a flag for the English-speaking community on Quebec, what would make sense since the French-speaking communities of majorirarily English-speaking provinces have their own flags. My final proposal was this, inspired by the provincial coat of arms and symbolizing duality and unity. For the complete rationale, click on the link on the top of the page. 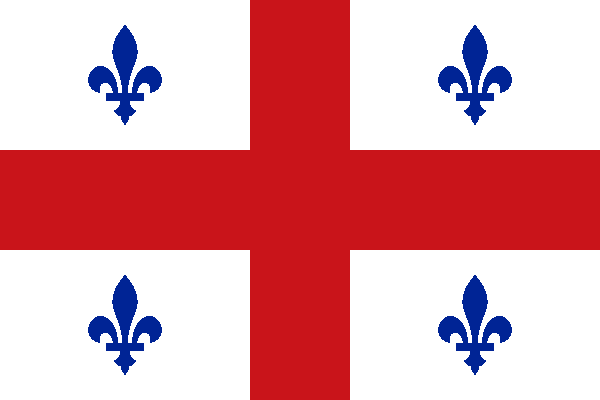 Recently, a commenter posted that Montreal flag could almost pass as a flag for the English-speaking Quebec. 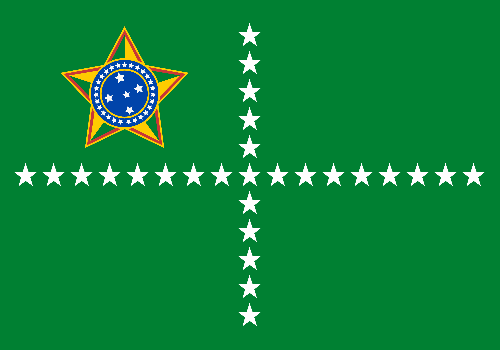 So I noticed to have a re-though on the flag. The red cross could also be handled as the St. George's cross of England, the birthplace of English language. 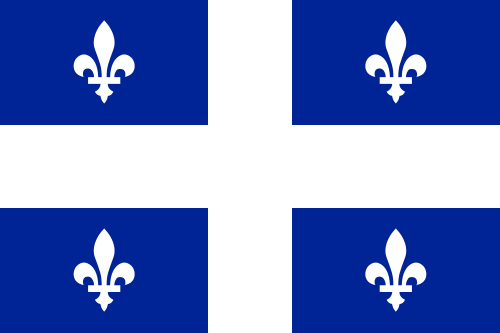 The link with the flag of Quebec makes it more suitable to the whole province, and not only Montreal. The disposition of colors have also a curious similarity with British flag. I like the final result, and it's bold but also very significative. Just curious: two consecutive flags on North America category. For today, one more request by the readers, this time by an anonymous commenter. It's for Miami, that, although don't have a terrible flag for American standards, is easily confused with India national flag by tourists. 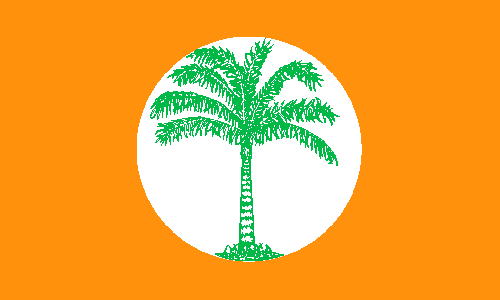 Like Indian flag, Miami's one have orange-white-green horizontal stripes with a circular emblem on central stripe, here a seal. The seal contains a palm tree. I couldn't find any source for the meaning of the colors, but I have a theory that it may be related to orange tree: orange for the fruits, white for the blossoms, green for the tree itself. 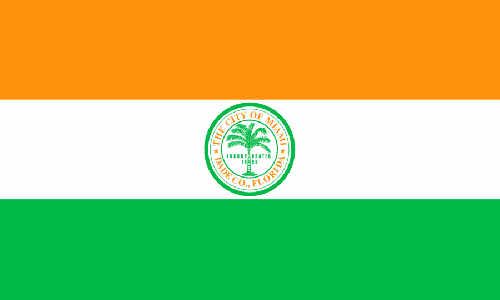 This flag is very bold, and wouldn't be absolutely strange for Miami residents. 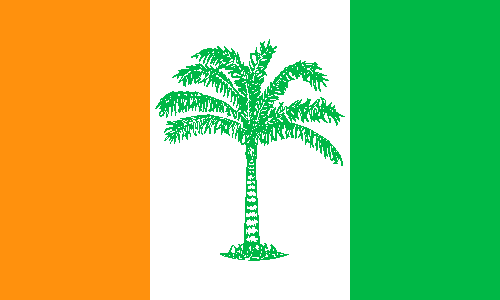 It's similar to Ivory Coast flag, but the palm tree may be enough difference. 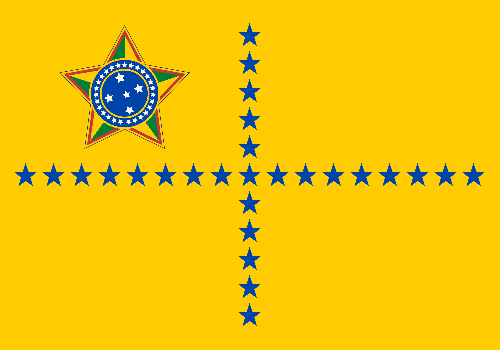 This flag keeps all the colors from current flag. 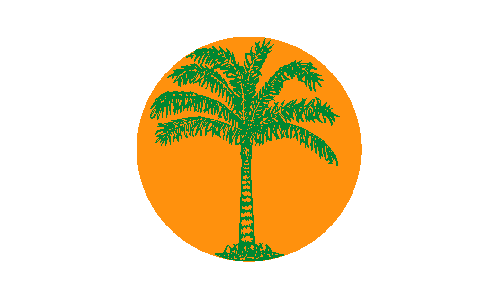 Putting the palm tree on a circle actually makes it remember the city's seal. The orange and circle combination remembers Miami's beautiful sunshine. It can also be related to "Orange Blossom Myth". In my humble opinions, all designs presented are good improvements of current Miami flag. The fact none is a total ruptures makes them easier to be practically adopted. If you have a suggestion for a future post, too, write me on comments. 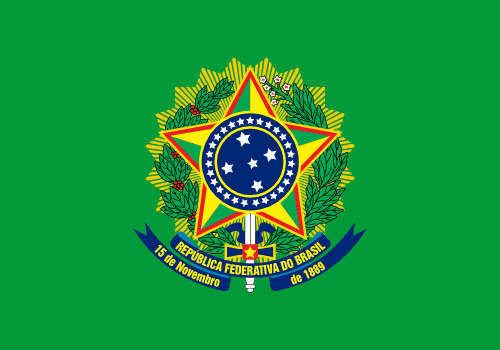 On Brazil, the acting president of Brazil is the first available on the following list: the president of the Republic, the vice president, the president of the Chamber of Deputies (low chamber), the president of Federal Senate (high chamber), the president of the Supreme Federal Tribunal (both the constitutional court and the highest court of appeal). The last three can only assume the presidency interim. The other three don't have known personal flags. So I created them using the same pattern of my proposal for the vice president. For the presidents of Chamber of Deputies and Federal Senate, I decided the background following the color of their chambers' noble hall: green for the Chamber of Deputies, blue for the Federal Senate. 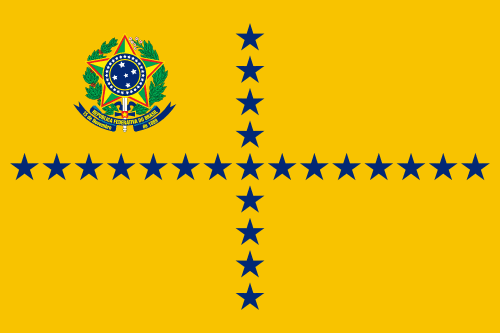 The stars are yellow, partly because I'd like to keep reserving the white stars on blue to the Navy usage. 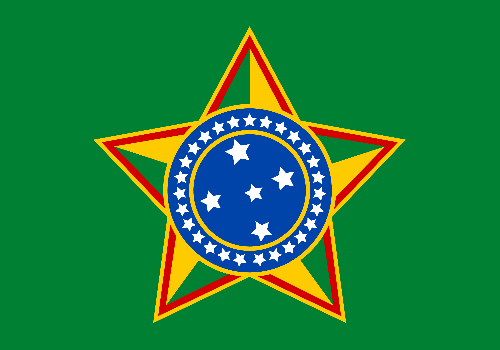 On the inferior left quarters, the silhouette of the well-known Parliament building, that hosts both houses, emphasizing the concave semi-sphere to Chamber of Deputies and the convex semi-sphere for Federal Senate on their respective flags. 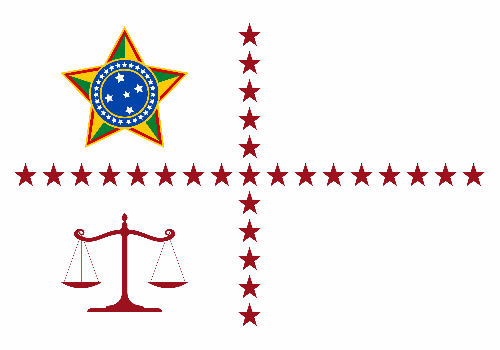 The noble hall of Supreme Federal Court is white, so I decided to put a white background on th flag of its president. On inferior quarter, I decided to put a balance scale, because its façade is not as famous and the parliament building. The stars and the scale are ruby color, as the ruby stone is associated with Laws. 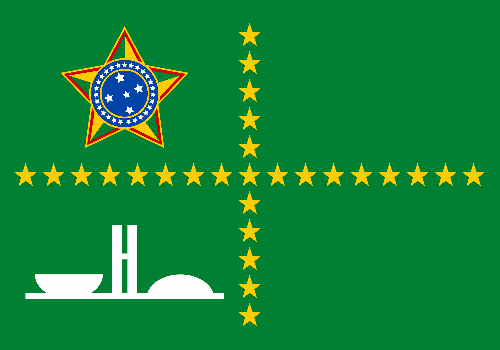 In a future occasion, I may post flags for the Federal Senate and Chamber of Deputies. Wait! 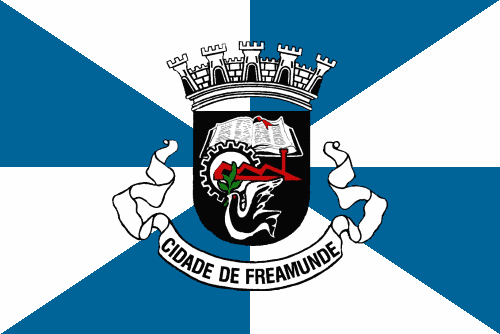 Freamunde is a freguesia of Paços de Ferreira, in Oporto district, Portugal. It's known for its Saint Sebastian and its capão (castrated, giant chicken). 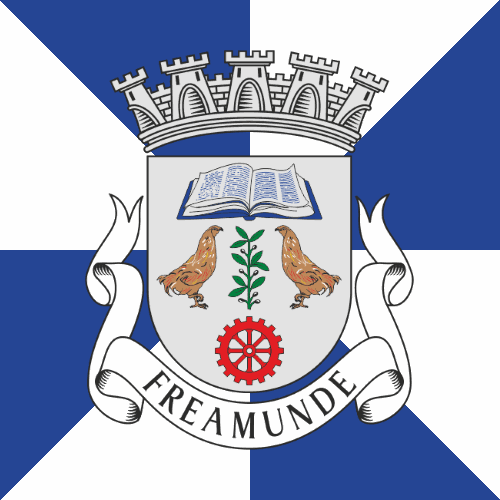 In 1991, it was proposed a flag for Freamunde, containing reference to the popular motto "land of culture, labor and peace": an open book, an engine, a chimney and a peace dove. Since then, it started being flown unofficially. As you can see, the charges of the coat of arms aren't arranged in a blazonable way, so, therefore, it can't be classified as strictly heraldic. I read reports of people that were used by former, unofficial coat of arms and complained against the new one. So I decided to fix the former to a more heraldic layout, using elements from the latter. Firstly, I decided to use the same blue and white gironny pattern from both flags. I put the book and the engine in black backgrounds, like the unofficial coat of arms. 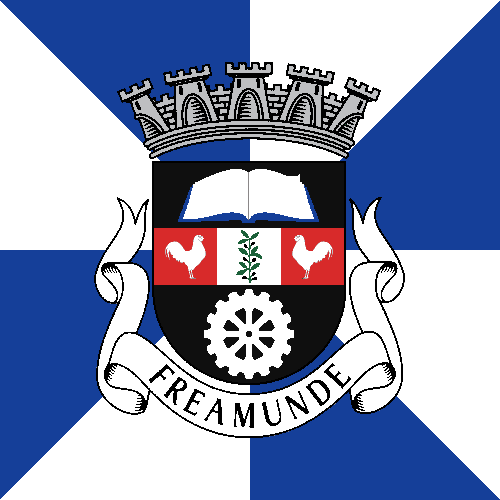 The capões are white on red background, inspired by the logo of its capões fair. On white background (the color of peace), the olive branch. 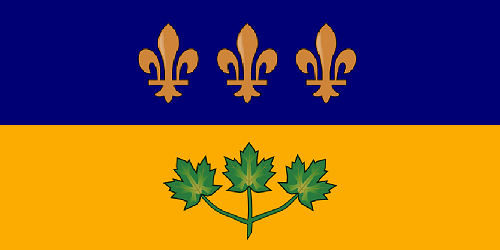 I liked the result, because I think it's a nice compromise between the two coats of arms and has a more functional layout. Sorry for posting thursday, I'm busy this week.